During my time working on Ashes of the Singularity: Escalation, I have made many new maps and reworked countless of the existing ones. There are recurring characteristics for the changes I make to maps, and criteria that I base most of my maps on, so I thought it would be interesting to articulate what it is that governs my map making and rework process. Making maps before the release of an RTS is difficult because as a designer, you don't know what formula of maps are going to work the best. Once extensive playtesting happens and feedback starts to emerge, the most popular maps can be replicated and expanded. 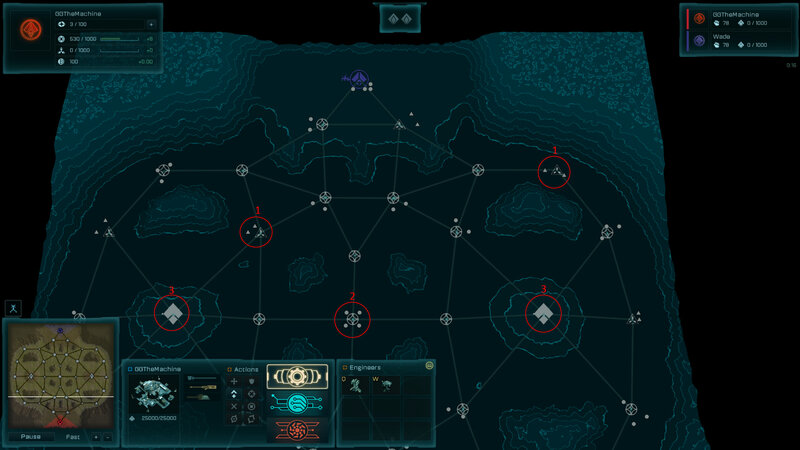 If you go back and play the launch maps of an RTS game, most of them are laughably bad and imbalanced. In other words, making a bunch of different maps and seeing what sticks is what tends to happen, and it's part of why we ended up with a lot of funky maps that needed reworks. If there are too many choke points, base defenses lock down the map, and it becomes very defensive and campy. Alternatively, aggression becomes overly prominent if a map is so open that players can easily avoid base defenses. There's a sweet spot in the middle, where the game flow is not too fast but not too slow. I typically aim for maps to have both areas of open terrain and other areas of choke points to create decision making about where and when to attack. The gentle use of high ground is important as high ground offers a strong defender's advantage. There's a similar a sweet spot for the proportions of resources; too much Metal and you're forced to spam frigates, but not enough Metal and frigates are neglected over high tech units. I aim for a 2.5/1 ratio of Metal to Radioactives as that's where the most strategic diversity occurs. It's not as simple as just counting the number of deposits, the accessibility of the resources and how dense they are for Amplifiers and Refineries is also a consideration. Cutoffs are frustrating if they're overly punishing, but can offer interesting tactical gameplay if done cautiously. 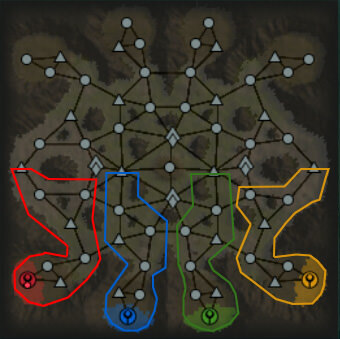 Disconnecting a player's base from the resources of the map should require cutting off at least two regions, with single cutoff points only used for smaller amounts of resources out on the map. The non-linear region design of Seginus and asymmetric sides offers lots of flexibility for different capping orders. 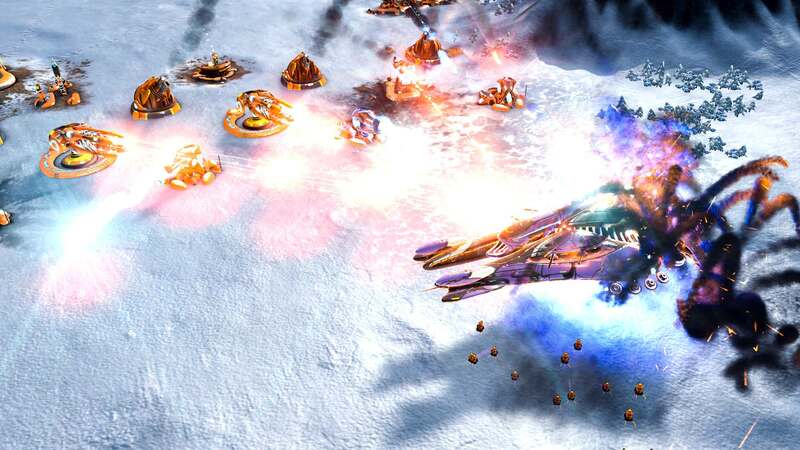 Players can delay capturing of the left side and some of the central Metal regions to rush the Radioactives regions to fuel faster air units or tech. Players wishing for an aggressive game can forego the sides to rush the central Metal region which boasts 4 Metal Deposits, but will need to keep up the pressure in order to hold the region and prevent counter-attacks. Players wishing to turtle could rush the Turinium Generators on the high ground, then lock them down with defenses and artillery to deny their opponent movement around the map and hold out for a VP win. Good maps make players think about which regions they prioritize, especially with our creeps that must first be cleared before a Generator can be captured. No maps should have overly strong positions that players default to every game because everything else is sub-optimal. There should be pros and cons to different areas on the map, if the middle has the same resources as the sides then players will prioritize the middle every time because it grants the ability for quicker map rotation. An area that grants high mobility should have fewer resources than the sides, while Turinium Generators and the rich resource regions should be spread out from each other. A bad map is predictable and repetitive, and while some maps have a center rich in resources, the exposed position means they're risky to saturate. I don't want to talk about cosmetics in this journal, but this point also bleeds into gameplay. If there's inconsistent spacing between regions it looks messy and means the game doesn't flow as well. Having several low yield regions right next to each other can create tedious gameplay of capturing and building Extractors. To tidy up a few maps I condensed regions together into a single richer region and standardized distances between Generators. Team members shouldn't be competing and bickering over resources. For team maps, resources near a player's base should be located in a way to suggest which regions each team member is supposed to capture. It's a limitation of our interface that you can't gift regions to allies, but either way, you don't want players and the AI accidentally capturing their allies regions because they're too close. All spawns should be balanced with access to equal amounts of resources; no one should get stuck with the bad spawn. Here's a breakdown of Delta Serpentis that shows each player's equal access to designated resources, despite there being lots of possibility for team strategy and combined attacks. The only one I wonder about is the "tidiness" argument. Does having it messier add a bit of complexity, especially because its harder to blitz through nodes. It makes the game slower, so having some "messy" maps could be beneficial. I think there should be a more deliberate way of increasing the capture difficulty of a location. Like neutral smarties or a second type of generator that just spawns tougher creeps. Just like how tirinium in the center is a low priority because of it relatively difficult to capture, the same could be done for nodes. For example, there could be a lv 2 power generator that serves as a backup connector. A player would have to divert resources in order to make their region harder to cut off. Another possibililty is the generator serving as a "all or nothing", being viable to take if the player solely rushes in that direction, but otherwise too difficult to capture during the early game. Problem with Ashes (at least for single player skirmish) is that there is not enough dynamic to the maps to make much difference from one to the next. Aside from 'Crack The Shell' (Which is a horrible skirmish map), there is not a single map that makes me have to change my strategy at all. 1. Richer Resource Nodes: They have several areas on some maps that have richer resources. They are usually in an area that is hard to defend/out in the open. Expanding there is a risk, but just might give you a resource edge to be able to out-produce your opponent. 2. Xel'Naga (Sensor) towers. These are towers that are placed in certain areas in which, when you move your unit near them, it gives you an view of everything going on in their range. Players don't usually camp these, but they may send a unit near them on their way somewhere else to see if the enemy is moving through there. 3. Destructable Barriers: Often there is a back door to your base area that has a barrier blocking it. This can be destroyed, by a crapload of damage, but it will allow a rear entry attack to an enemy base. Sometimes these barriers are blocking items 1 or 2 above to make them harder to get to. Inclusion (or lack thereof) of these items and their placement will usually force you to change strategy in order to compensate. I think Ashes needs to think about including something on their maps that adds this level of dynamic.